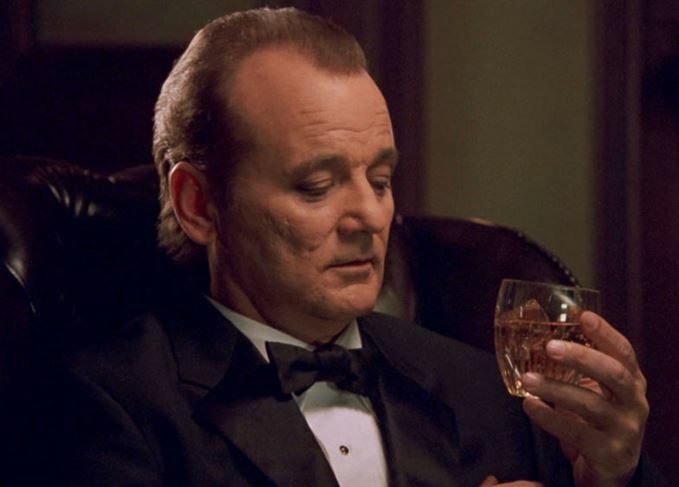 The jet-lagged and jaded movie star set adrift in Tokyo while filming an ad for Suntory whisky remains the most celebrated role of Bill Murray’s acting career. Richard Woodard reports. Fading film star Bob Harris, played to deadpan perfection by Bill Murray, spends the 2003 movie Lost in Translation in a state of permanent dislocation; jet-lagged, incapable of sleep and adrift in an alien culture, thousands of miles from his increasingly joyless marriage. Reluctantly in Tokyo to front an ad campaign for Suntory whisky, Harris bonds with a young American woman, Charlotte (Scarlett Johansson), staying at the same hotel with her celebrity photographer husband. Like Harris, she cannot sleep. As the isolated pair grow increasingly close, themes of love, life choices and family are gently explored. Their relationship teeters on the verge of infidelity, before pulling back from the brink in a touching late-night scene where Harris chastely touches Charlotte’s foot as they drift off to sleep. Harris/Murray and Lost in Translation director Sofia Coppola are treading a well-worn path. Over the years, Japanese whisky ads have featured a long line of Hollywood celebrities, from Orson Welles to Keanu Reeves; Sean Connery to Sammy Davis Jr. In 1980, Coppola’s father, The Godfather director Francis Ford Coppola, filmed a series of ads for Suntory alongside celebrated Japanese film-maker Akira Kurosawa. There are also echoes of other films. The neon-punctuated black Tokyo skyline has the dystopian feel of Blade Runner; while writing the screenplay, Coppola was thinking of Brief Encounter and, for Bob and Charlotte, the relationship between Humphrey Bogart and Lauren Bacall in The Big Sleep. How much more is evident if you compare the original script to the final film. Murray’s gift for improvisation conjures some of Lost in Translation’s finest moments, such as the filming of the ad (Coppola wouldn’t tell him what the director was shouting at him), the unscripted exchanges with the photographer and the ‘black toe’ scene at a sushi bar (the script simply says: ‘He makes her laugh’). Coppola wrote the Bob Harris part with Murray in mind, but securing his services was another matter (the actor is notoriously elusive and eschews conventions such as agents and email addresses). It took about a year and, even with the crew in Tokyo and a reported $1m spent on the film, Coppola still didn’t know when, or if, the star of her film would turn up – because no contract had been signed. Murray arrived in Tokyo a week after everyone else, and spent much of the shoot in a jet-lagged state that mirrored the condition of the character he was playing. Johansson, meanwhile – then only 17 – described herself at the time as ‘busy, vulnerable and tired’. After a limited early cinematic release, Lost in Translation took off, eventually making $120m at the box office. It was also nominated for four Academy Awards – Best Film, Best Director, Best Original Screenplay and Best Actor. It won only one – Coppola for Best Original Screenplay – in the year that Lord of the Rings: The Return of the King all but swept the board. Murray had been odds-on favourite to be named Best Actor (he won a Golden Globe and a BAFTA), but lost out to Sean Penn for Mystic River. When Penn’s name was read out, Murray didn’t applaud. While the ‘Suntory time’ line has lingered in the public consciousness, the film’s enduring mystery revolves around its final scene, when Harris stops the car taking him to the airport to pursue Charlotte through the Tokyo crowds. He catches up with her, they embrace, he whispers something to her, they kiss, they part. But what does he say to her? Naturally, it’s not in the script. There are all kinds of theories, and some people have used technology in an attempt to amplify Harris’ words, with varying results. One internet hypothesis has Harris as Charlotte’s husband, time-travelling from the future to spend more time with her (he does the Suntory ad because time travel is expensive). A new blend of whisky from five different countries will be labelled as a ‘World Whisky’.